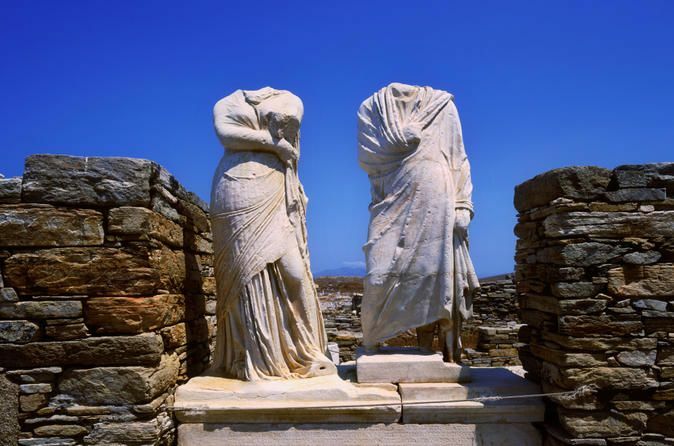 Enjoy a guided tour of the archeological site of Delos where you will learn about the religious and mythological significance of this island. See the artifacts that have been unearthed from the long dead city- mosaics, Naxos marble lions, and statues. Meet your private guide at the ferry port and transfer to Delos Island. At its prosperous peak, the island was covered in temples and sanctuaries dedicated to all sorts of gods. Delos was once an important trading point in the Mediterranean and the major religious center of the Aegean Sea. It is said to be the birthplace of the Apollo, the god of music, light and beauty. Pilgrims came from all over with gifts and offerings, making the island an important sanctuary. Excavations of the 19th century unearthed the remains of a once vibrant town- mosaics, the Naxos marble lions and statues are some of the ancient artifacts you will see here. Full commentary by your guide will bring this city back to life. Transfer back to Mykonos with your guide in the ferry to begin your tour of the Old Town. Together with your guide, you will wind through Mykonos' narrow labyrinthine streets on this walking tour. In the event of high winds the local ferries cannot operate and all trips to Delos are cancelled.